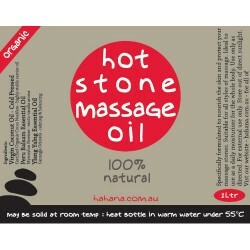 Hahana's signature, Organic Hot Stone Massage Oil! Organic Coconut Massage Oil - specifically formulated for Hot Stone Massage. Beautiful aroma and highly stable when heated. Hahana Hot Stone Massage Organic Coconut Oil won't stick to your stones like other seed and nut oil - makes cleaning a breeze. Great as a body moisturiser too!